Hydrogeo were commissioned to assist at an industrial facility with a pioneering history of manufacturing and engineering in South-West England. The facility required the formation of substantial new engineering machine bases within the existing operational site. 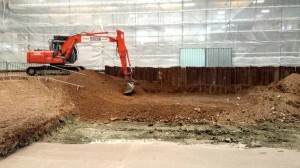 Hydrogeo initially undertook a pre-commencement site investigation as the installation of new multi-million pound engineering machinery required the removal of a large amount of subsoil. The intrusive site investigation confirmed the presence, concentration and extent of a hydrocarbon contaminated layer of soil associated with historical works at the site. The contamination was determined to be lubricating and cutting fluids from milling machines which had seeped into the subsoil. Hydrogeo were present on site during the excavation phase of construction to assist with the classification of spoil as excavated. 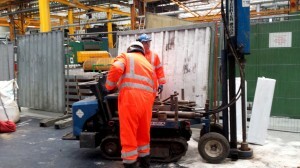 Guidance from the site investigation and in-situ screening by our onsite consultant allowed the appropriate retention of clean and separation of remaining waste streams into appropriate waste categories. This classification process resulted in significant project savings in haulage, landfill tax and offsite disposal costs.